Chromestart5.ru is the PUP that uses misleading techniques to prevent removal. Use Reimage to locate malicious components and get rid of them faster than with uninstall instructions. A full system scan blocks virus reappearance and prevents traffic to malicious domains. How did Chromestart5.ru hijack your system? Has your homepage address unexpectedly changed to Chromestart5.ru, which features a never-seen-before search engine? If so, then a super intrusive cyber pest has infected your PC, which is widely known as Chromestart5.ru virus. Now that you have run into this computer infection, you should be aware of a few things. First of all, it is not considered malicious; second, it causes redirects to websites that seem to be vague. Therefore, we advise our readers to remove Chromestart5.ru redirect virus and rely on more reliable Internet search tools instead. It appears that this search engine has been created purely for monetization purposes, aiming to drive web traffic to affiliate websites. 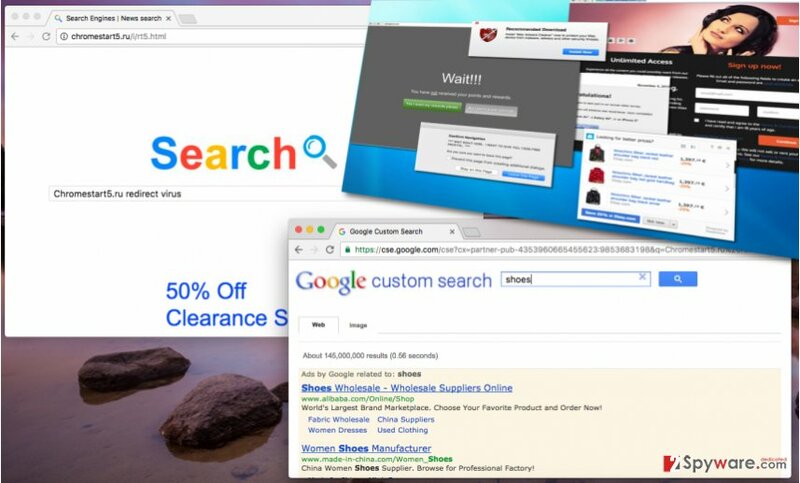 To achieve this goal, this hijacker silently occupies the computer system, adds tracking cookies, and gathers information about user’s interests. It collects user’s search queries, clicks, bookmarks, browsing history information, and analyzes it, so that later on it can display tailored advertisements and integrate targeted third-party ads into Chromestart5.ru search results. If you do not dream about visiting questionable websites that promote themselves with the help of such potentially unwanted programs, then you should make Chromestart5.ru removal your top priority. To uninstall this hijacker, use anti-spyware application Reimage and let it do the system digging automatically, or if you prefer to remove Chromestart5.ru manually, use instructions we present below this report. If you have never heard about web browser hijackers in your life, you should know that these programs are designed to get inside victim’s computer unnoticed and make essential changes to be able to force the user to use a particular search tool. Such vague search tools help to generate money by complementing regular search results with sponsored links. Users who happen to click on these sponsored links generate pay-per-click revenue for authors of this browser hijacker, fueling their efforts and encouraging them to create more browser hijackers and distribute them more actively. Sadly, authors of such search tools often do not endorse third-party links they present and claim to be not responsible for any damage that might happen during user’s interaction with such external websites. In other words, you might accidentally enter a phishing website or a site that serves malware-laden ads and then the only one to blame will be the user who has decided to continue using this suspicious search tool. If you do not want to be redirected to such sites, think twice before using this search tool. Potentially unwanted programs are known for their skills to deceive the computer user and sneak into his/hers computer seamlessly. Sadly, computer users themselves allow Chromestart5.ru hijack to happen, however, typically little do they know anything about it. It is so because browser hijackers, adware programs and other computer threats often get inside the computer system along with other software, which seems trustworthy at first sight. However, many free programs have a tendency to spread third-party software alongside them, which is normally presented as recommended and reliable. Unfortunately, a part of computer users still believes that these additional downloads are trustworthy and keep installing them. Others do not even know about these extra programs, because they tend to hop over all installation steps without even adjusting the setup settings, which, to say at least, are the most important part. To avoid installing unwanted software, users should change installation settings by deselecting unwanted programs via Advanced or Custom settings. If you tend to hurry through the installation process, then there is no surprise how did this hijacker get inside the computer system. However, if it has hijacked your system already, remove Chromestart5.ru virus with Reimage or similar software. Alternatively, you can use these instructions we provide and uninstall it manually. If you have any questions about Chromestart5.ru removal, do not hesitate to ask us. Here, look for Chromestart5.ru or any other recently installed suspicious programs. Wait until you see Applications folder and look for Chromestart5.ru or any other suspicious programs on it. Now right click on every of such entries and select Move to Trash. When in the new window, check Delete personal settings and select Reset again to complete Chromestart5.ru removal. Once these steps are finished, Chromestart5.ru should be removed from your Microsoft Edge browser. Here, select Chromestart5.ru and other questionable plugins. Click Remove to delete these entries. Now you will see Reset Firefox to its default state message with Reset Firefox button. Click this button for several times and complete Chromestart5.ru removal. Here, select Chromestart5.ru and other malicious plugins and select trash icon to delete these entries. Click Reset to confirm this action and complete Chromestart5.ru removal. Here, select Extensions and look for Chromestart5.ru or other suspicious entries. Click on the Uninstall button to get rid each of them. Here, look at the Homepage field. If it was altered by Chromestart5.ru, remove unwanted link and enter the one that you want to use for your searches. Remember to include the "http://" before typing in the address of the page. Now you will see a detailed dialog window filled with reset options. All of those options are usually checked, but you can specify which of them you want to reset. Click the Reset button to complete Chromestart5.ru removal process. This entry was posted on 2016-09-13 at 08:10 and is filed under Stealing programs, Viruses. You can quickly scan the QR code with your mobile device and have Chromestart5.ru virus manual removal instructions right in your pocket. How did you remove Chromestart5.ru virus?